Many occultation observers, including newly recruited observers seem to think that to video record occultations requires a VCR and a small television, in addition to the telescope. This complicates the occultation observations with unnecessary equipment to carry around. 1) VCR - even the smallest VHS format VCR’s are not that small. They are cumbersome to carry around and set up and usually require 110 volt AC power source. These units also have strict temperature and humidity limits for good operation. 2) TV monitor - A small television monitor might be a 12" screen or a smaller 5" screen, and again a 110 Volt power source is needed. Even if run on internal batteries, a separate TV monitor is another piece of equipment that needs to be setup and wired into the occultation system. 3) Power source - If your just planning to observe occultations from your back yard, an extension cord is all you need. But if you plan on observing the more spectacular lunar grazing occultations and asteroid occultations you must have a PORTABLE system. To run 110 volts to operate the VCR and TV, a 12 volt to 110 volt power converter would be needed. If you do have a power converter that runs off your car batttery, this is fine, but you must observe right next to your car to power up. Even a portable 12volt source such as a the commercially available auto power boosters are heavy (15 lbs) and bulky to transport around. This system shown here is completely portable, completely battery powered and all equipment (including the telescope) fits into an average size backpack !! The total weight including the telescope is just 26 lbs. Thus this system can go on airplanes, and the observer can video record from remote sites not accessible by car or boat. 1) Telescope - meade 2045d, sct. this is a f/10, 1000mm focal length 4" aperture telescope. This telescope is no longer made, it was replaced by the Meade ETX series. Now before you think you have to go out and buy a costly ETX telescope with the computerized "goto" control, STOP! 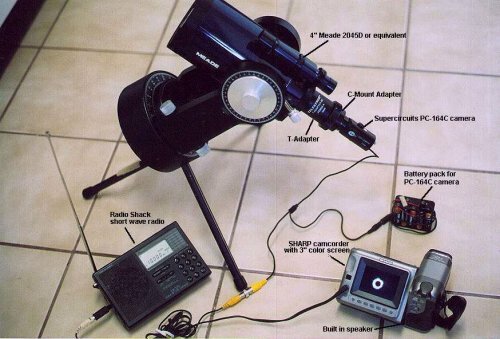 Although a computer controlled telescope is nice and convenient, it is not required ! Meade sells a non computer telescope in the 3.5 inch (90mm) size, its the "etx 90 ra". 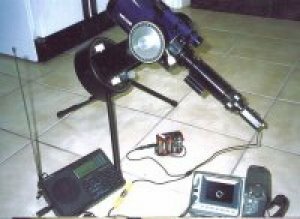 Its the exact same telescope as the computer driven ETX-90, but has no computer control. It does have however, an accurate motor drive. 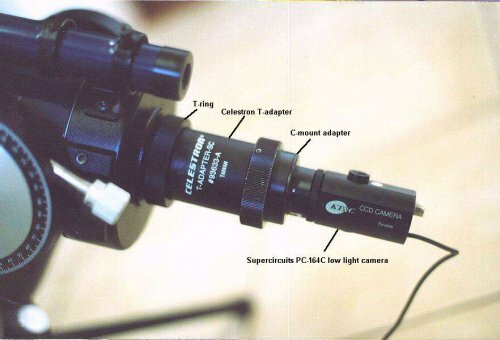 And the cost of this scope is as low as $179.95 from www.apogeeinc.com. This telescope is sold by most Meade dealers, but Apogee, Inc. has the lowest price that I’ve seen. A Celestron NexStar 4" or 5" telescope is a good choice also, except they are moe costly, retailing new for $499 and $1,149 respectively. EXACT POLAR ALIGNMENT IS NOT NECESSARY !! If your scope is aligned to within 2-3 degrees of the pole, the drive system should keep the target star in the field for 5 minutes easily without any adjustments. Of course the closer you align to the pole, the less adjustments you’ll need for your occultation event. These telescopes have manual fine adjustment knobs for declination so you’ll always be able to keep the target star in the field of the camera/video. Power source - 3 "aa" batteries for the Meade ETX 90 RA. Batteries install into scope drive base. 2) Video Recording - I use a non digital Sharp 8mm camcorder with a built in 3" color viewing screen and built in speaker (model vlvl-e650u). this unit is no longer made. it has been replaced by the sharp models vl-ah131u ($279.99 from best buy) and vl-ah151u ($299.99 from best buy. circuit city, and some wal-mart and sam’s clubs sell these also). both these models are nearly identical in appearance and functions to the older model i use. (the more expensive vl-ah151u has a higher zoom). These sharp camcorders have the ability to simultaneous record both video and wwv time signals audio directly onto the video tape without any microphones or fancy cables. and furthermore, they have built in speakers so you can hear the wwv time signals and see the occultation exactly as it happens in real time !! In this system, the sharp camcorder is only used as a vcr and monitor. It is not intended to record occultations directly using its built in lens and zoom. power source - supplied camcorder battery, it can usually record for 1-1½ hours before recharging. 3) Video Camera - Supercircuits pc-164c black and white ccd camera for $129.95 from www.supercircuits.com. This small camera weighs just 3½ ounces, size is 1.25 x 2.5 inches. Its low light rating of 0.0003 lux is just as sensitive as the more expensive watec cameras. The pc-164c has a slightly smaller size chip than the watec camera but this is a non-issue. The field of view at prime focus on my meade 4" f/10 telescope is 15 x 20 arc minutes, which is perfectly adequate for all types of occultations and recording Baily’s Beads during eclipses. Power source - 10 "aa" batteries. The cable from battery pack to PC-164-C is sold by Supercircuits also. The battery pack is sold by Radio shack and electronic parts stores. Batteries can provide 3-4 hours of use before replacement. 4) Video camera adapter - Use T-mount type adapters available from most telescope dealers. Also you’ll need a C-Mount adapter. 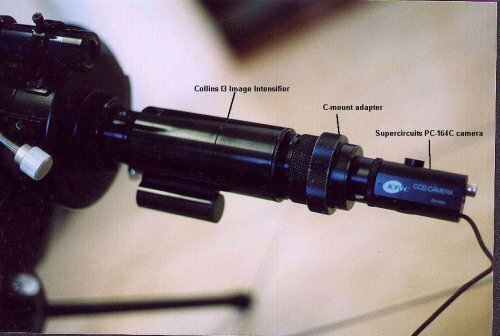 The T-Adapter screws into the threads on the back of the telescope, and the C-Mount adapter threads into the T-adapter. 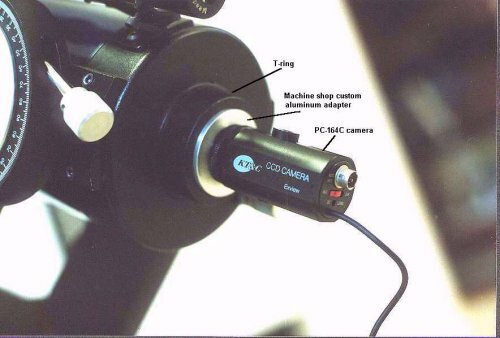 The PC-164C camera threads into the C-mount adapter as shown in photo No. 5. The cost for these adapters varies, they are approx. $25-$35 each. The Meade ETX series requires a SCT accessory adapter, cost: $30. Here I had a machine shop make an aluminum adapter for the PC-164C camera that threads directly into the back of the telescope. Cost: $50. 5) f/6.3 focal reducer - This increases the field of view to about 19 x 25 arc minutes, and helps slightly with reaching fainter magnitude limits, but is not necessary initially. Cost: around $115-130. 6) WWV time source - Radio shack model DX-375 digital tuning radio. You can program in WWV at 2.5, 5, 10, 15 and 20 Mhz so that they can be re-called from memory instantly. Cost: about $100 (less if on sale). This radio has an earphone jack which is the key to direct recording onto the video tape. The supplied audio/video Input/Output cable for the Sharp camcorder plus a mono to mono RCA plug adapter allows the time signal to be recorded directly onto the video tape. Other features of this radio - It has a strap for hanging, a fold out stand, a "on/off lock" so you don’t accidentally have it on in a suitcase and wear out the batteries if traveling, and one touch station recall from 9 memories. Power source - 2 size "c" batteries, they can last for hours of continous play. 7) Optional Image intensifier - The Collins I3 optional image intensifier is placed in between the back of the telescope and the C-Mount adapter. Everything else remains the same. This device comes ready to install. It is sold by Collins Electro Optics (www.ceoptics.com). Its expensive ($2,000, plus $100-$250) extra for a video adapter. This unit was reviewed in Sky and Telescope, February 1999, page 63. The Collins I3 piece will add 3 magnitudes to the limit of your video system. And it can also be used for visual observing also with the enclosed 25mm eyepiece, adding 1.5 - 2 magnitudes to your visual limit. Its also great for star parties in light polluted areas. As can be seen by the photos, this simple portable system sets up quickly, and its easy to use. Outside noise interference doesn’t matter, since the WWV time signals record directly onto the tape simultaneously with the video from the PC-164C camera.